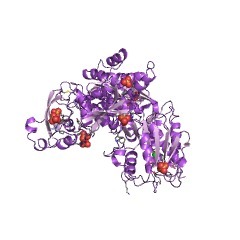 Polbase - Reference: Insights into DNA replication: the crystal structure of DNA polymerase B1 from the archaeon Sulfolobus solfataricus. Insights into DNA replication: the crystal structure of DNA polymerase B1 from the archaeon Sulfolobus solfataricus. To minimize the large number of mispairs during genome duplication owing to the large amount of DNA to be synthesized, many replicative polymerases have accessory domains with complementary functions. We describe the crystal structure of replicative DNA polymerase B1 from the archaeon Sulfolobus solfataricus. Comparison between other known structures indicates that although the protein is folded into the typical N-terminal, editing 3'-5'exonuclease, and C-terminal right-handed polymerase domains, it is characterized by the unusual presence of two extra alpha helices in the N-terminal domain interacting with the fingers helices to form an extended fingers subdomain, a structural feature that can account for some functional features of the protein. We explore the structural basis of specific lesion recognition, the initial step in DNA repair, describing how the N-terminal subdomain pocket of archaeal DNA polymerases could allow specific recognition of deaminated bases such as uracil and hypoxanthine in addition to the typical DNA bases.